The Students’ Union in collaboration with the Oracle club and Computer club is organising a FOICDT Web competition. 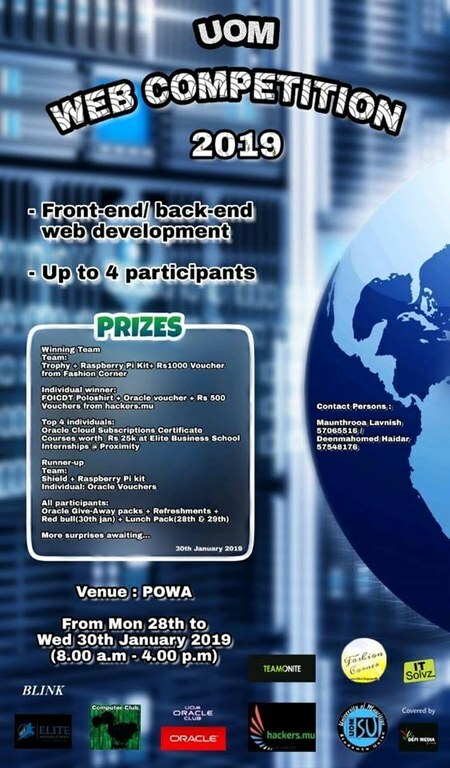 The UoM Web Competition has in aims to influence and attract the students of the University of Mauritius to showcase their talents in web design including both website front-end and back-end. This event will take place on the campus of the University of Mauritius itself. There shall be jury panel composed of few lecturers and guests to award the participants. The participants will be given a theme at the start of the event and they will have to work on the front end/back end either individually or in groups of up to 4 members. Participants are required to bring their own laptops. Seating arrangements will be taken care of. And live multi-plug outlets will be provided to the students. The event will last for 24 hours and will be split into 3 days. Starting at 8.00am and ending at 4.00pm.